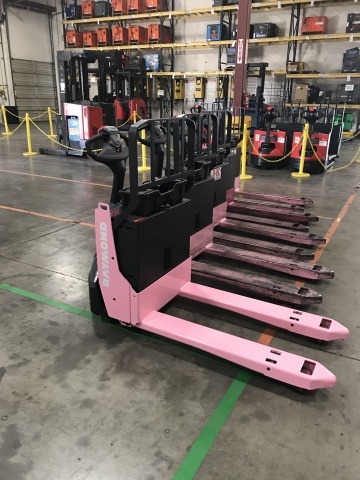 FREMONT, Calif.--(BUSINESS WIRE)--Raymond Handling Concepts Corporation (RHCC), a leading materials handling equipment supplier in Northern California and the Pacific Northwest, today announced the winning bids for its fifth annual Pink Pallet Jack Project online auction. A total of $9,470 was raised through two pallet jacks sold to J&K Trucking and Prism Logistics, as well as a $1k donation from Cascade. All proceeds raised from this year’s auction were shared between the Tina Fund in Greene, New York and HERS Breast Cancer Foundation in Fremont, California. RHCC would like to personally thank John Souza of J&K Trucking, who has continued to support Raymond Handling’s fundraising efforts by placing the winning bid for a lift truck every single year the auction has taken place. Because of his generosity, the annual charity auction has now raised almost $150,000 for breast cancer charities doing amazing things in their communities.